As a new angler, you may be wondering what type of equipment and tools you will need. This is normal, and if you do not pack the right tools, your fishing trip can quickly turn into a bust. 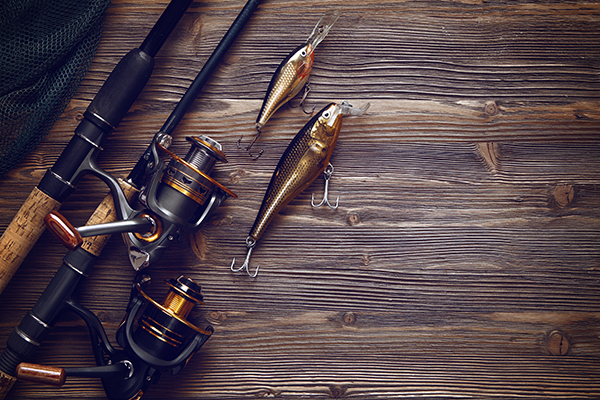 To help you better prepare, the team at FishingLicense.org has compiled a list of the most essential fishing equipment below. If you are going to fishing, you will definitely need something to transport your equipment in. To be a successful angler, the team at FishingLicense.org believes that you must be able to organize your equipment, and the Berkeley tackle back is one of the most reliable bags on the market. They are priced to sell and get the job done. All anglers need a reliable set of pliers, and there is no better place to buy them than The Fishing Tree. With a lifetime warranty, The Fishing Tree’s needle nose pliers will always be there for you. They cut through tackle and line perfectly, and will fit snugly inside your belt loop or tackle box, even though they come with their own pouch. Their slim profile also ensures that they don’t take up too much space. Every angler should have a rubber worm in their arsenal, and there are plenty of types and brands to choose from on Amazon. Before making a final purchase, be sure to research the species you intend to catch so you can choose the right one. Longtime anglers suggest choosing a dark green worm if you plan to catch bass, other colors may work as well. Keep in mind that rubber worms are usually the most effective in freshwater environments. Whether you prefer saltwater or freshwater fishing, the Yo-Zuri Crystal Minnow is perfect for beginners and experienced anglers alike. Manufactured in a variety of patterns, the Crystal Minnow is perfect for catching trout, grouper, snapper, and redfish. It also comes in a unique 3-D model that will certainly impress you in deeper waters. FishingLicense.org experts recommend using the Minnow the next time you go deep sea fishing. Everyone hates Mosquitos, and if you want them to keep their distance from you, Bull Frog Mosquito Coast Sunblock and Insect Repellant will do the job. It does two jobs at once, helping to shield you from the sun and keep insects away at the same time. Priced just above $10, FishingLicense.org experts think that every new angler should be sure to stock his or her tacklebox with this product. High-quality eyewear is a must-have when it comes to spending large amounts of time outdoors. Costa Del Mar sunglasses come in a wide range of colors and sizes, and will protect your eyes from the sun at all times. Specially designed to never fall off your face, you will have a picture-perfect view of the water (and hopefully catch more fish). The sunglasses are polarized and have been tested in a variety of water conditions.